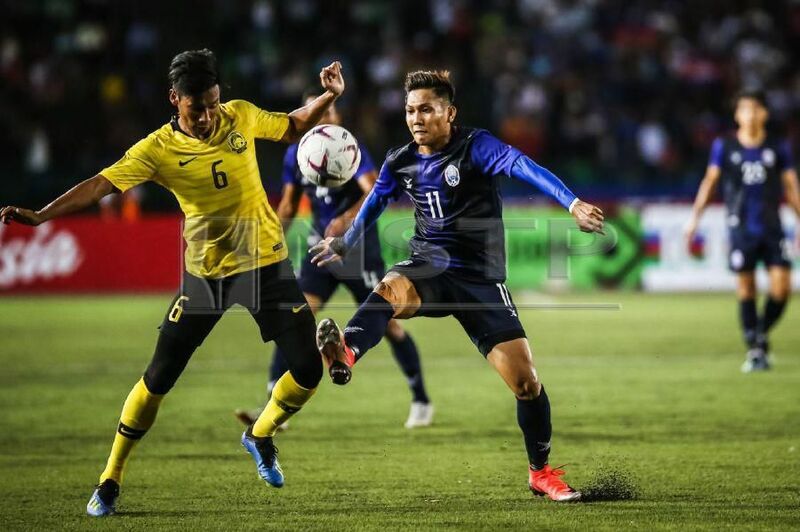 PHNOM PENH: Malaysia got off to a winning but nervy start in the AFF Cup when they edged Cambodia 1-0 in Thursday’s Group A match at the Olympic Stadium here. The win on enemy ground did not come without its trials and tribulations. Despite not having team manager Keisuke Honda on the bench, Cambodia came out of the blocks faster and threatened to score in the early minutes of the game. Tan Cheng Hoe's boys found it tough playing on the venue’s uneven artificial pitch and only managed to gather their composure and structure after 20 minutes. Norshahrul Idlan Talaha netted the only goal in the 30th minute. Malaysia also had attempts hit the post in each half through forwards Safawi Rasid and Mohamadou Sumareh. Captain Zaquan Adha Radzak said: “We expected a tough start to the game based on our last meeting with Cambodia in September. “Cambodia were good on the artificial pitch, but we managed to absorb the pressure. “End of the day, we got the three points which will give us plenty of confidence going into our second match (against Laos). I hope this win will give us the needed boost. “However, our performance was not perfect. We need to improve to a point that we can maintain our composure and also show our ‘A’ game. Zaquan knew his team was nervous at the start of the match in front of approximately 38,000 spectators but was nevertheless pleased to see the response showed by his teammates. With six players making their debut in the competition in an away fixture, it was always a tough ask for them to be firing on all cylinders right from the start. The fact that Malaysia managed to step up and win put the team in the right mode for the next match.